Mike George lists some top choices. I am old enough to remember when the Olympic Blues packet featured a picture of Jackie Stewart, who, at the time, was as famous as a trap shooter as he was Formula One driver. The standard competition load in those days was 1 1/8oz and in the 1980s Sporting Gun and Eley did much to popularise the use of 1oz (28gr) loads. 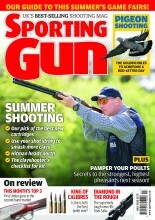 It was not long before the CPSA made 28gr mandatory for domestic disciplines. “Blues” are now available in 24 and 28gr loadings, with either plastic or Fibre wads. Cases are 70mm and the claimed muzzle velocity is 1,400 feet per second. This is Eley’s subsonic cartridge and the clay-shooting load of 28gr is assembled in a 67mm case. Shot size is 7.5. Eley claim the muzzle velocity is 1,050 feet per second, so it’s going to be quiet as well as very low in recoil. Online price: £251 per 1,000.